My husband, TJ, is a devoted husband, father, family member, employee and friend to everyone he knows. He’s spent the past four years in a “commuting triangle” between Chicago, IL – Cocoa Beach, FL and Cherry Hill, NJ. While we’re grateful for this job that provides for our family… let’s face it … it’s not the ideal situation. When he accepted the role in Chicago, our intentions didn’t start out that our family would be separated in three different states spanning 2,300 miles. However, circumstances were beyond our control. We had to make tough decisions. Some people may have thought we were crazy, or worse, getting a divorce! During this time, there were days we felt like we could barely ‘keep our heads above water.’ Loneliness and doubt sunk in. Our relationship with God suffered. However, there were also good days – cherishing the windows of time we had together, either as a couple or a family. This kept us hopeful that there was a larger plan in all of the craziness. Julia Maria from Ometepe who contacted us in January 2017, to humbly ask for help to attend University (Matthew 21:22). A young family with five kids here in Florida showed us what it’s like to truly walk by faith, not by sight (2 Corinthians 5:7). They abandoned their comfortable life in another state far way to follow a calling into the mission field serving the poor in Florida. Madelyn. She is a full-time 23-yr old missionary in Nicaragua, whose love for Jesus and to gather His sheep is so contagious. (Isaiah 40:11). Hilder. A young 21-yr. old man supporting & carrying his family in Ometepe. Hilder’s gift is teaching English language and love for Jesus (Romans 12: 6-7)– All are great needs in Nicaragua. With each encounter, we became more finely tuned to: Ask, Walk, Tend, Gather, Carry, Teach and Lead – all to advance His Kingdom, not ours! We put ourselves at God’s disposal, and He put more people (too long to mention all the names here) in our paths. What happened in our family and with the ministry have been miraculous. On January 10, 2018, One Body Global Ministries hired Hilder to start teaching English classes on Ometepe for young adults and children. The same day, T.J. received a written job offer from his employer to work in Florida! Now what remains for us on His mission seem more clear. As Christians, I believe God wants us to know, first and foremost, that we are at His disposal – from our most simple acts as the Body of Christ (1 Corinthians: 27). Sometimes it comes to us through the written word, sometimes through the people or unexpected events in our daily lives. How will you respond when God needs you to be at His disposal? During a trip to O metepe Island, Nicaragua in late November, I was awoken at 4:00 am to the sound of fireworks and loud music from about 1/2 mile up the road. The local residents were celebrating a special day in Advent at church before their workday began at sunrise. I was made aware by my friends, Tom & Esther, that the entire month of December was a firework-filled preparation leading up to Christmas. 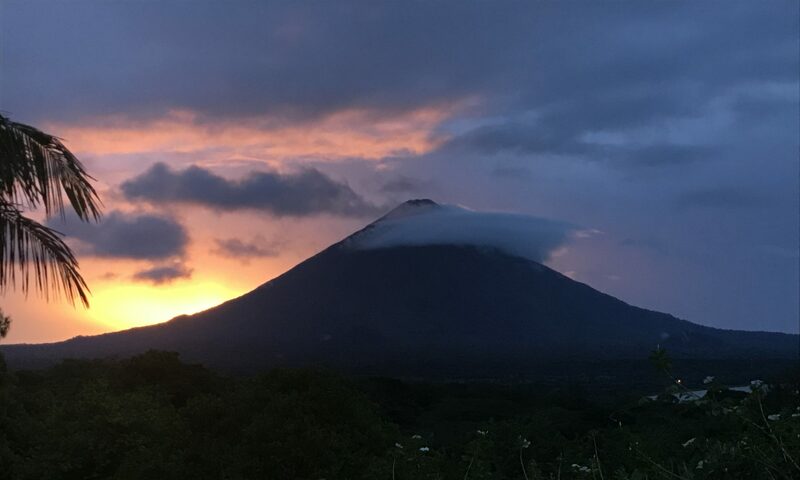 Throughout that morning, afternoon and early evening, fireworks permeated the landscape on Ometepe as a reminder of Christ’s upcoming birth. While fireworks and Christmas lights are very different methods, both are meant to light up the sky and draw our attention to the same, larger meaning of Christmas: the ultimate hope, promise & light of Jesus, our Savior! John 1:9 The true light that gives light to everyone was coming into the world. When I returned home to the US in early December to all of the newly-hung Christmas lights in my neighborhood, instead of noticing how “pretty” the lights looked, I found myself reflecting on, and finding gratitude in, God’s perfect gift of grace through the birth of His Son, Jesus – wohoo! It felt like fireworks inside of me. This Christmas, I wish the same awesome feeling for you and your family (without the 4:00 am fireworks episode). Also, as you make your 2018 New Year’s resolution(s), consider how you can be a light for Jesus in your family, community or beyond. He wants us to be a light for others. Matthew 5:16 In the same way, let your light shine before others, that they may see your good deeds and glorify your Father in heaven. One attribute that my mother instilled in me at an early age was “to be an indpedent woman.” I suspect she was emulating the changing times of the 1970’s & 80’s, when women were claiming their independence in the workplace and in leadership roles throughout American culture. I am grateful for her encouragement, and it has shaped me into the strong person that I am today. To have to ask for help, however, is not an easy task for me. Stepping into the missionary world and walking in faith, I need to learn how to better embrace this. From asking how to say a word in Spanish, or asking directions, or to asking sponsors for donations, I need to put my ego aside and remember “the ask” is really from Jesus and not for me. This was the mindset we had to embrace when making this video, and as I prepare to go to Ometepe November 25 – December 2. John 14:13-14 (NIV)13 And I will do whatever you ask in my name, so that the Father may be glorified in the Son. 14 You may ask me for anything in my name, and I will do it. Enoy the video below. Thank you for your support and continued prayers. Dios le bendiga! Meet Julia Maria. She is the sister of one our medical sponsor recipients who unfortunately passed away in October 2016. Through her faith in Jesus and the inspiration of her sister, she’s completing year 1 of her 5-year foreign language degree at University of Managua. In July 2017, she joined us in Granada for sight seeing before meeting her family on Ometepe. Financial assistance is needed to supply books, materials, meals and travel expenses that are not covered by her education scholarship. You can help Julia Maria by donating to our ministry (please specify One Body or Rochelle Scott in the ministry field). Waiting on others can be a challenge. For instance, have you ever waited in a long line at the grocery store and the cashier is really slow at bagging, or even worse, she encounters a glitch with the computer system? Sometimes you just want to scream about how much time we spent waiting on others. As I grow older, I have learned to embrace these times as a gift to talk to Jesus or to find gratitude that I have two healthy legs to stand upright in a line in an air conditioned building (living in Florida is hot). Recently though, my patience has been challenged with slower-than-expected progress on our plans to build our mission house on Ometepe Island, Nicaragua. Luckily, I was able to take step back and remind myself that I am NOT in control of this process — He’s in charge! Knowing this is so comforting to me. Whether you are waiting to hear from someone about your next job, medical test results or delivery of a promise, when the time is right…the Lord will make it happen. The smallest family will become a thousand people, and the tiniest group will become a mighty nation. At the right time, I, the LORD, will make it happen. Meet sisters, Arelis and Julia Maria. Both of these young ladies are shining examples of complete faith in Christ’s unconditional love. Through their journies, they inspire us to remain strong in our faith and to traverse through whatever obstacles come our way. Our lights shine brighter because of them. We are steadfast in our commitment to our calling. We trust in His unfailing love. Psalm 13:5 – But I trust in your unfailing love; my heart rejoices in your salvation..